The cult of the omnipotent state http://rexcurry.net/nazi%209a5.jpg and the worship of government. In his book "Lincoln Unmasked," the author Thomas DiLorenzo deflates all the stereotypical Lincoln legends about slavery, the war, and more. Harry Jaffa, the head of what Thomas DiLorenzo calls the "Lincoln cult," has more than once compared the Southern cause to that of the National Socialist German Workers' Party (NSGWP). DiLorenzo's book humiliates Jaffa with quotations from the most notorious book by the leader of the NSGWP, wherein support was written for the War of Northern Aggression and for Lincoln's destruction of state's rights and for Lincoln's opposition to political decentralization. Lincoln was the favorite president of the NSGWP's leader. The German leader said that the NSGWP "would totally eliminate states’ rights altogether: Since for us the state as such is only a form, but the essential is its content, the nation, the people, it is clear that everything else must be subordinated to its sovereign interests. In particular we cannot grant to any individual state within the nation and the state representing it state sovereignty and sovereignty in point of political power." Thus the "mischief of individual federated states…must cease and will some day cease…. National Socialism as a matter of principle must lay claim to the right to force its principles on the whole German nation without consideration of previous federated state boundaries." Eric Foner, the socialist professor of history who has spent much of his career at Columbia University, has even cited Lincoln on behalf of the preservation of the Union of Soviet Socialist Republics. DiLorenzo's book cites a February 1991 article in "The Nation" called "Lincoln’s Lesson," in which Foner denounced the secession movements in Latvia, Lithuania, Estonia, and Georgia, and called upon Mikhail Gorbachev to suppress them with the same ruthlessness Lincoln showed the South. According to Foner, no "leader of a powerful nation" should tolerate "the dismemberment" of Soviet socialism. "The Civil War," Foner explained gushingly, "was a central step in the consolidation of national authority in the United States." And then: "The Union, Lincoln passionately believed, was a permanent government. Gorbachev would surely agree." Modern American socialists boastfully repudiate the Lincoln myth about slavery and they declare that Lincoln's so-called "Civil War" was the violent suppression of independence, exactly what Foner wanted to see under Soviet socialism. In 1939 the National Socialist German Workers' Party and the Union of Soviet Socialist Republics joined as allies to invade Poland in a pact to divide up Europe, and WWII spread. 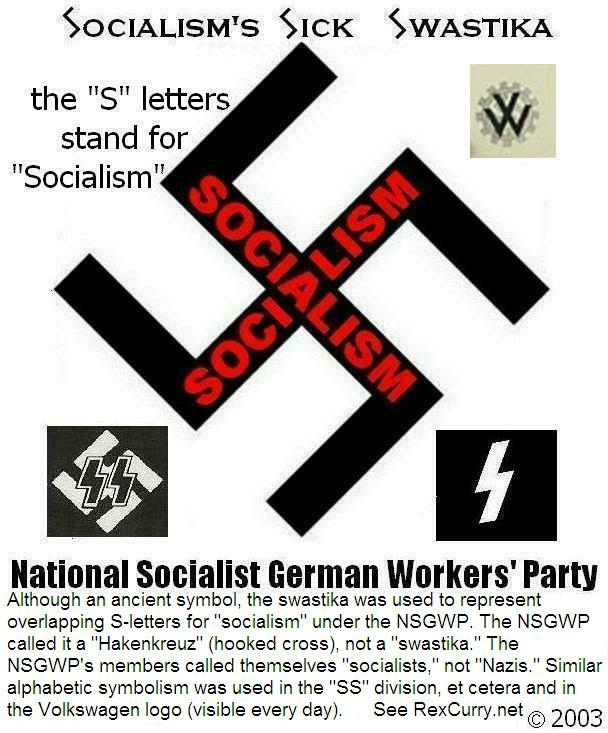 It led to the socialist Wholecaust (of which the Holocaust was a part): ~60 million slaughtered under the Union of Soviet Socialist Republics; ~50 million under the Peoples' Republic of China; ~20 million under the National Socialist German Workers' Party. They proved that socialism is a lost cause. The Bellamy's wanted the government to take over everything, including schools, and they wanted schools to be used as re-education camps to create the "industrial army" out of children and impose "military socialism" in America. That is why the Bellamys wanted a flag over every school and they wanted children to robotically chant to it at the ring of a government bell daily for twelve years of their lives like a brainwashed cult of the omnipotent state. Foner's endorsement of Lincoln's modus operandi is echoed by all democrat-socialists and republican-socialists on the national, state, county and city levels. It explains the USA's massive socialism, enormous taxing and spending, and its growing police state. In 1863, General Ulysses S. Grant was instructed to revoke Order No. 11, which had called for the expulsion of all Jews from Tennessee, Kentucky and Mississippi. During the Civil War, smugglers were illegally selling southern cotton to the northern textile factories. Grant, commander of U.S. Army forces, believed that Jews were primarily behind this illegal cotton trade, and he decided to expel all Jews from southern territory. Grant wrote: "No Jews are to be permitted to travel on the railroad southward from any point... The [region] must be purged of them." Based on Grant's orders, Jews were expelled from their homes, including 20 families from the town of Paducah alone. Some Jews were denied rail transportation and had to flee northward on foot. Those who did not cooperate were thrown into prison. Jewish community leaders immediately arranged a meeting at the White House with President Lincoln, who cancelled the expulsion order. Grant, who would later become U.S. president, never offered any explanation or apology. If what you get back is a spirited defense of the ideas of this country's Founding Fathers, what you've got is a libertarian. By shameful default, libertarians have become America's last and only reliable stewards of the Bill of Rights. in continuing to possess her in an involuntary association, when her heart and mind had left him long ago? History tells us that Lincoln was a politically ambitious lawyer who eagerly prostituted himself to northern industrialists who were unwilling to pay world prices for their raw materials and who, rather than practice real capitalism, enlisted brute government force -- "sell to us at our price or pay a fine that'll put you out of business" -- for dealing with uncooperative southern suppliers. That's what a tariff's all about. In support of this "noble principle", when southerners demonstrated what amounted to no more than token resistance, Lincoln permitted an internal war to begin that butchered more Americans than all of this country's foreign wars -- before or afterward -- rolled into one. strategic and tactical purposes. For the same purposes, Lincoln declared, rather late in the war, that black slaves were now free in the south -- where he had no effective jurisdiction -- while declaring at the same time, somewhat more quietly but for the record nonetheless, that if maintaining slavery could have won his war for him, he'd have done that, instead. If libertarians ran things, they'd melt all the Lincoln pennies, shred all the Lincoln fives, take a wrecking ball to the Lincoln Memorial, and consider erecting monuments to John Wilkes Booth.Libertarians know Lincoln as the worst President America has ever had to suffer, with Woodrow Wilson, Franklin Roosevelt, and Lyndon Johnson running a distant second, third, and fourth. resounding failure. Abraham Lincoln was America's Lenin, and when America has finally absorbed that painful but illuminating truth, it will finally have begun to recover from the War between the States. CULT OF THE OMNIPOTENT STATE http://rexcurry.net/edward%20bellamy.jpg Francis Bellamy and Edward Bellamy succeeded in creating a ritualistic cult of the omnipotent state in the U.S.A.